When forward-thinking Chicago Department of Transportation (CDOT) Commissioner Gabe Klein reported for work on May 16 as part of Mayor Rahm Emanuel’s new administration, it marked a sea change in the city’s priorities. After spending most of the twentieth century trying to make it easier to drive, City Hall was switching its focus to promoting healthier modes: walking, biking and transit. 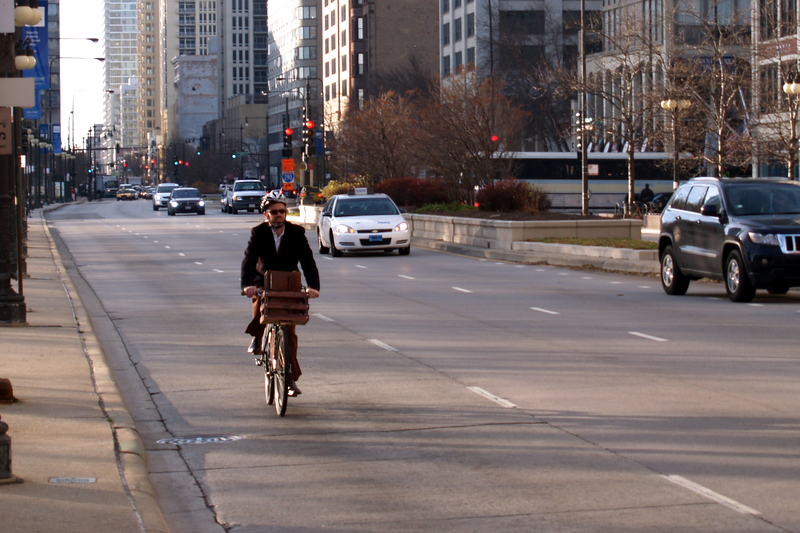 Sure, Mayor Richard M. Daley was an outspoken proponent of bicycling, but the end of his long reign was widely viewed as a period of stagnation. During this time the city did relatively little to promote sustainable transportation, partly because CDOT was a revolving door, with five different commissioners within the last six years of the administration. During this period our town fell behind other great U.S. cycling cities that were successfully pioneering green initiatives like car-protected bike lanes, public bike-sharing systems and “ciclovia” events which shut down streets to make room for car-free recreation. Meanwhile Chicago was still futilely trying to fight auto congestion by removing pedestrian crosswalks, cutting walk-signal times, and installing slip lanes and right-on-red signals to help drivers make faster turns. After Emanuel won the election, his choice of Klein made it clear the mayor-elect was serious about green transportation. The new commissioner was fresh from a stint as transportation director for Washington, D.C., where in a mere twenty-three months he made numerous pedestrian safety improvements, launched a new streetcar system, expanded the downtown circulator bus system, piloted car-protected bike lanes and created the nation’s first and largest bike-share system. Klein hit the ground running here as well. Within six months the commissioner racked up an impressive list of accomplishments and firsts. 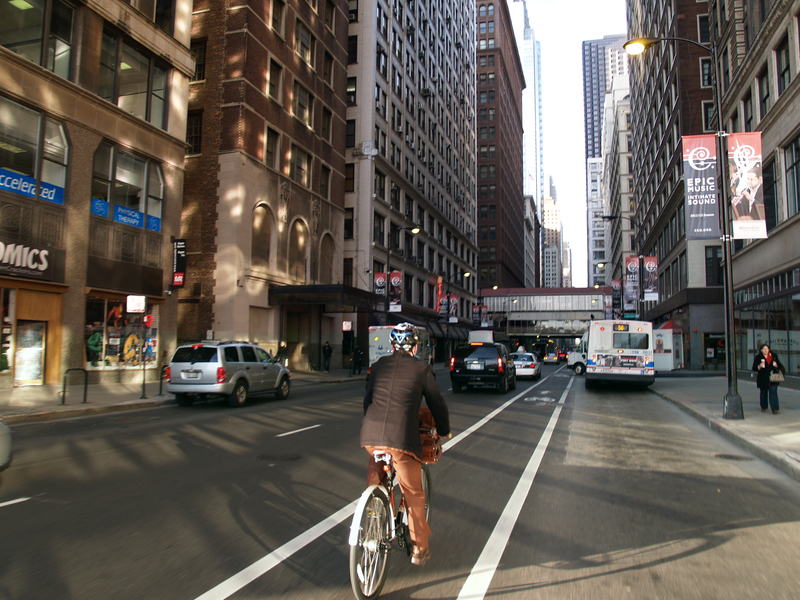 Just a few weeks after he took office, CDOT installed the city’s first protected bicycle lane on Kinzie Avenue, bumping rush-hour bike traffic from a twenty-two percent mode share to a high of fifty-one percent, meaning there are sometimes more bikes on the street than cars. New protected lanes on Jackson Boulevard and 18th Street are nearly finished, and the city plans to install one-hundred miles of protected lanes within Emanuel’s first term. 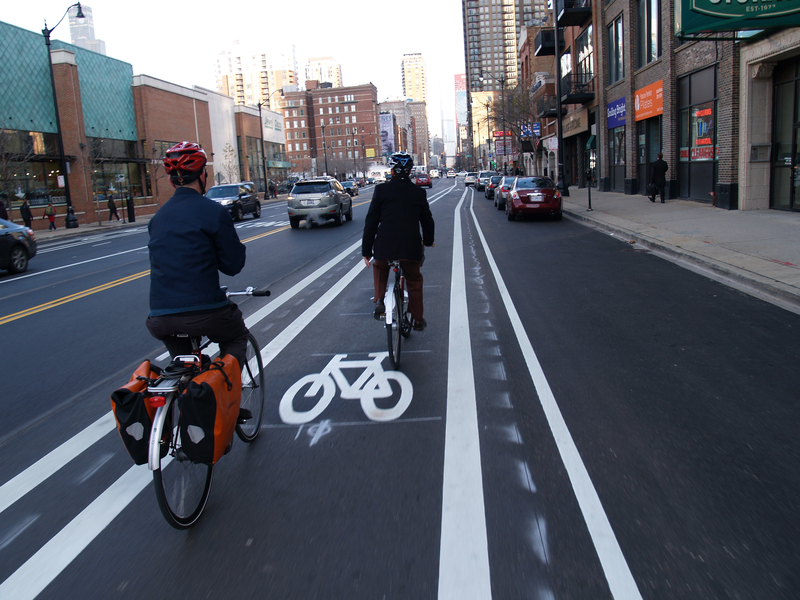 Under Klein, CDOT has begun striping conventional bike lanes continuously through intersections, and at long last the agency has installed a bike lane on Madison Street, breaking the Daley-era taboo against lanes in the central Loop. Chicago’s first on-street bike-parking corral, a common sight in cities like San Francisco and Portland, Oregon, landed in Wicker Park this summer. The city recently issued a request-for-proposals for an operator to launch a 3,000-vehicle bike-sharing system this summer, adding 2,000 more bikes in the next two years. And while the contract to design the Bloomingdale Trail, an elevated rails-to-trails, had been stalled for the last two years under Daley, immediately after the regime change the Department of Procurement Services approved the contract and preliminary design work started. Klein plans to complete the trail by the end of Emanuel’s first term. CDOT is currently working with the Chicago Transit Authority to launch bus rapid-transit corridors, with pre-paid boarding and dedicated bus lanes. The transportation department is now drafting the Chicago Pedestrian Plan, and in October CDOT launched a safety awareness campaign, with thirty-two mannequins installed along Wacker Drive representing pedestrians killed by cars last year, plus placard ads portraying the devastating effects of reckless driving. 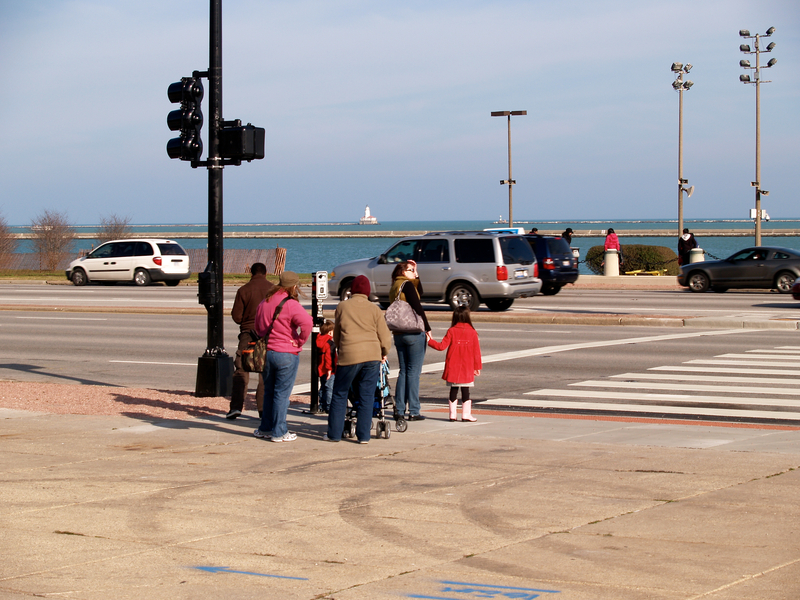 And while in 2005 Daley had the pedestrian crossing between Buckingham Fountain and the lakefront fenced off to speed car traffic on Lake Shore Drive, on Thanksgiving Day Klein reopened the crosswalk, a powerful symbol of the city’s new attitude. “Klein is running his department differently than other CDOT chiefs,” agrees Lucy Gomez-Feliciano, who manages health and sustainable transportation projects for the Logan Square Neighborhood Association. “It’s feeling like the commissioner wants to get things done and have an impact,” she says. At only forty years old, Klein’s personal style is also very different than a typical Chicago bureaucrat. He’s the first CDOT commissioner to make full use of social media to promote his agenda, tweeting frequently about the latest transportation news. His Twitter profile lists pop culture, pizza, hip-hop and international beaches among his passions, and he gained a reputation as a clotheshorse when he showed up for the July opening of the Kinzie protected lane, nattily dressed in a white linen suit. Klein is also far more accessible than most of his predecessors. In the early 2000s I spent several years at CDOT’s bicycle program working under Commissioner Miguel d’Escoto, who eventually resigned after a trucking scandal, but I barely met the man. In contrast, Klein is already a familiar face at rallies, ribbon cuttings and galas, and it’s easy for the public to contact him via Twitter and Facebook. Last October at Open Streets on State Street, Chicago’s first downtown ciclovia, he even volunteered for the dunking booth, and Ron Burke threw the pitch that dropped the commissioner into a tank of fifty-five degree water. We meet up for our ride at 8am under cobalt skies at 14th and Michigan, near Klein’s South Loop apartment. True to form, he’s wearing a 1950s brown pinstripe suit that he bought used for $56, spending another $25 for alterations. 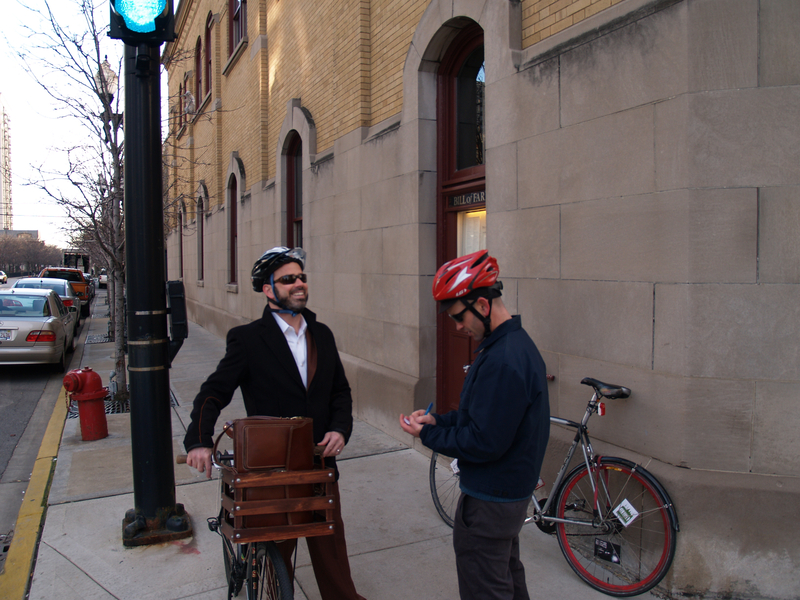 His bike is a Masi Soulville seven-speed cruiser with silver fenders and a wooden beer-carrying crate in front that holds his Italian leather briefcase. It’s freezing out but he’s not wearing gloves. Klein was born on Valentine’s Day 1971 in Hartford, Connecticut, to parents who were part of the Beat Generation, he says. His Irish-Catholic mother was a lifelong artist. His Jewish father dropped out of NYU in the 1950s and moved to Japan, where he established a successful adhesive-tape import business. “Supporting himself with this company basically allowed him to follow his dream, which was to be involved in civil rights and politics,” the commissioner said during our interview at CDOT. The commissioner traces his not-so-secret love of classic automobiles back to his father. When Gabe Klein was three the family moved from Hartford to Putnam, Connecticut, and his dad opened the Silver Bike Shop where Gabe helped out as a kid—but autos also fascinated his father. “He got a different car probably every six months,” Klein says. “So the infatuation with transportation runs in the family.” His father also had a keen interest in yoga and meditation, and on weekends he helped maintain the fleet of vintage Cadillacs belonging to his guru, Swami Satchidananda, the holy man who gave the opening benediction at the Woodstock festival. The swami’s Integral Yoga institute was headquartered down the road from Putnam in Pomfret, Connecticut. In addition to bikes and cars, Gabe Klein’s youthful obsessions included computers and yoga. He bought an Apple II at age ten with a loan from the local credit union, planting the seed for his current affinity for technology, and he decided he wanted to study under Satchidananda. When the guru opened the Yogaville Vidyalayam, an interfaith school along the banks of the James River near Buckingham, Virginia, Klein followed him there at age eleven. At the ashram he lived with various families, including that of classmate and future Dave Matthews Band bassist Stefan Lessard, until Klein’s family moved to the area to open a second bike shop. Other Yogaville students included actor Liev Schreiber and Weezer’s Rivers Cuomo, with whom Klein played Dungeons & Dragons. “There were some very creative kids there,” Klein says. “It really changed my life.” He still practices yoga every week with his wife Stephanie, and he says the spiritual lessons he learned from Satchidananda strongly influence his life choices. “I’m half Jewish and half Catholic, but I grew up more Hindu,” he says. We ride by Grant Park and the headless, armless bodies of Magdalena Abakanowicz’s “Agora” sculpture to our right, as we pedal toward the white monolith of the AON Center and other gleaming skyscrapers. Soon we’re at the Art Institute of Chicago, whose famous lions sport Christmas wreaths. The commissioner went to high school in Charlottesville, Virginia, and then majored in marketing management at Virginia Tech. After college he worked for Bikes USA, the nation’s largest bicycle retailer at the time, eventually managing operations for the entire chain and helping expand it from about ten stores to about twenty. At Madison Street, Klein rides up onto the sidewalk below the Millennium Park Bean, preparing to make a pedestrian-style left turn.“Sorry, I forgot to get in the left lane,” he explains. We continue west in the new Madison bike lane, situated between car lanes to our left, and bus-only lanes to our right, and it’s a bit unsettling to pedal with motorized traffic on either side. Due to the Wacker Drive rehab project, when CDOT originally striped the bike lane this summer it stopped at Wells Street, but it was recently extended to Wacker. “I just got a picture of it tweeted to me by a constituent,” Klein says. “He thanked us for it.” The commissioner forwarded the tweet to the mayor as an example of how residents are grateful for the new bike facilities. Now we’re pulling up to LaSalle Street. As Klein is about to turn north a cab speeds by, inches from his front tire. “That was almost bad,” he says with a smile. After Fenty lost his reelection bid in 2010 and the administration changed at year’s end, Klein traveled to Costa Rica, did consulting work and pondered his next move. He’d been offered positions leading various state departments of transportation, but these positions didn’t spark his imagination. Klein’s commute went smoothly this morning, but he’ll spend the whole day working to move forward—he has plans, projects and events he’s planning and executing to make biking more accessible to Chicagoans. This Saturday, December 10, from 10am to 4pm, CDOT will hold an open house at 23 East Madison, the first of four community input sessions to help determine locations for the next ninety-seven miles of protected bike lanes. This selection process will lead to the Streets for Cycling 2020 Plan, and Klein says the city will install the next twenty-two miles of protected lanes by mid-May. CDOT recently won $36.5 million in federal and state funding to help finance the Bloomingdale Trail, estimated to cost $50-$70 million. 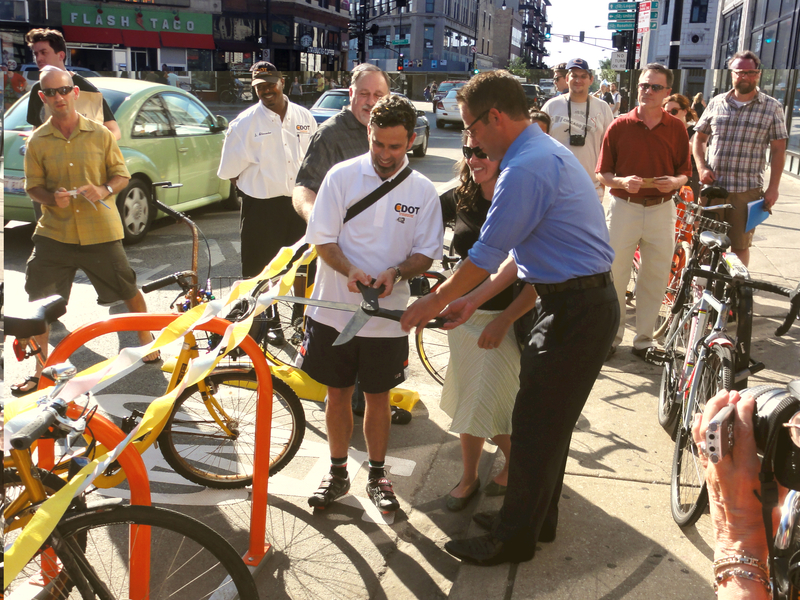 Another $18.5 million grant will pay for the bike-sharing system. Klein says the city will choose the contractor to run the system in early 2012 in preparation for the summer launch. The commissioner says the final draft of the Chicago Pedestrian Plan will be published in February and CDOT will also be installing one hundred new “leading interval” walk signals, which give pedestrians a head start over turning cars, as well as more countdown signals and high-visibility crosswalks. Construction will start on the Jeffrey Boulevard bus rapid-transit corridor on the South Side next year, and work on a downtown corridor from Union Station to Navy Pier will begin in 2013, including a new bus terminal at the southwest corner of Jackson and Canal. Klein is particularly excited about the Chicago Forward Agenda, CDOT’s upcoming two-year master plan. It will cover everything from specific metrics like determining the kind of materials to be used for permeable alleys, to broad policies like “complete streets” guidelines dictating that roadway projects must provide good accommodations for all users, not just drivers. Besides John McCarron’s op-ed in the Tribune, there have only been a handful of negative newspaper stories about the commissioner’s plans, but will there be a large-scale revolt once CDOT starts taking significant amounts of real estate away from cars for protected bike lanes and bus rapid transit? With his background in marketing, Klein thinks he can prevent a major backlash by educating his constituents about how better walking, biking and transit facilities can make the streets safer, more efficient and more fun for all Chicagoans, including motorists.